Tennessee Weighs The Cost Of A Free College Education Tennessee's governor has proposed to pay community college tuition for anyone who needs it. The plan is intended to help boost higher education completion rates for the state, which ranks near the bottom nationwide. Tennessee Gov. Bill Haslam delivers his State of the State address to a joint session of the General Assembly on Monday in Nashville, Tenn. In the speech, he proposed spending the state's lottery money on free community college education for those in need. Pretty soon, going to community college in Tennessee may become absolutely free. Republican Gov. Bill Haslam unveiled the proposal in his annual State of the State address this week. 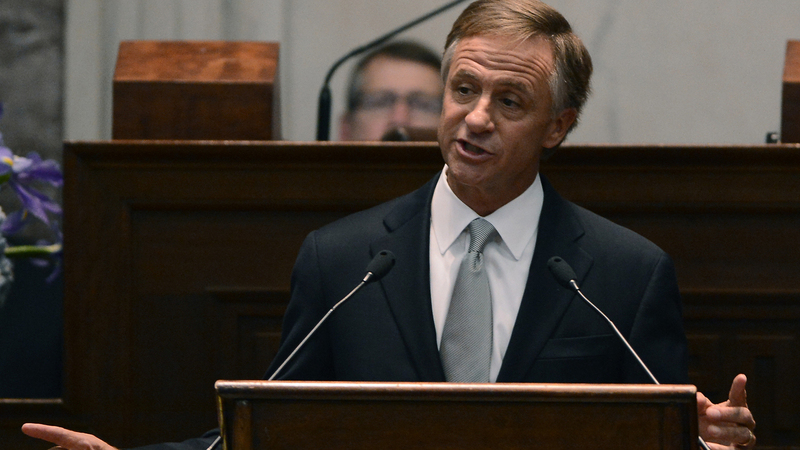 Haslam is trying to lift Tennessee's ranking as one of the least-educated states. Less than a third of residents have even a two-year degree. But a community college free-for-all has been tried elsewhere, though not sustained, and there's always a nagging question. "So I know you're wondering," Haslam said. "How do we pay for this?" Haslam told state lawmakers he'll tap into a mound of excess cash generated by the state's lottery. Roughly $300 million would go into an endowment. The returns would pay to send high school seniors without other scholarships to community college. "Net cost to the state, zero. Net impact on our future? Priceless," he said to a round of applause. It's an effective one-liner that's been praised by education leaders and students. "That's awesome. I think that's great," says Randy Prior, who is studying engineering at one of Tennessee's 13 community colleges. He loves the idea of free tuition. For 27-year-old Vanecia Akins, money prevented her from starting a degree right after graduation. "That's one of the main things that kept me from school," Akins says. "I didn't know how I was going to pay for it." Breaking down this financial barrier has been praised by national higher education officials. One told The New York Times it's the best idea for boosting college participation in a generation. Even frequent foes of Tennessee's governor hopped on board. State Sen. Jim Kyle of Memphis has wanted to use more of the lottery money for years. He says community college makes perfect sense. "Quite frankly, you can get just as good of an education in most instances and you can do it at less cost to the taxpayer, which means more people can go," Kyle says. The move already has families of high school seniors taking a closer look at two-year schools. "That very situation is being played out in this Senate office with one of our staffers," Kyle says. That staffer immediately called her granddaughter, a high school senior, after learning of the governor's plan. Alexis Frierson was asked to consider staying closer to home instead of attending the University of Memphis. "That's just not what my mind is set on, going to a two-year and then transferring," Frierson says. From the state's perspective, though, a student would at least have an associate degree, even if they didn't go on to a four-year program. "Yeah, it looks great. But in reality, when you're working with limited funds, [it's] not so good," says Rep. Steve Cohen, who helped start the lottery as a Tennessee lawmaker. As in several other states, lottery ticket sales are used primarily for four-year, merit-based scholarships. Under the governor's community college plan, there would be no grade requirement. "You're going to spend a lot of time and money on people who aren't going to graduate," Cohen says. And to help pay for the proposal, the four-year scholarships would be cut by a thousand dollars for freshmen and sophomores. Catherine Leisek of the National Council for Higher Education says that money could make all the difference. "Students who are scholastically prepared for university will be pushed into a two-year system possibly, because of the money," Leisek says. Would they really go on to finish a bachelor's degree? It's impossible to know. But Leisek says the higher education world will be watching Tennessee to find out.